The system includes a PIC controller which generates a PWM signal to the peltier driver, which will be further amplified and received by the peltier module. The peltier module then provides the heating or cooling effects to the thermochromic ink on the fabric. The temperature sensor mounted on the fabric with the ink then feedback to the PIC for the feedback control. Finally, the colour changing will be displayed on the fabric. For the construction of a sensitive temperature feedback system, firstly, a thermistor was chosen to exam the temperature variations. As a comparatively cheap and highly sensitive thermistor is required in the system, a monolithic temperature detector TMP04 was selected. In the future implementation, it will be mounted on the fabric to receive the ambient temperature which is directly above the thermochromic ink. Here is the front and back view of the temperature sensor TMP04 purchased. 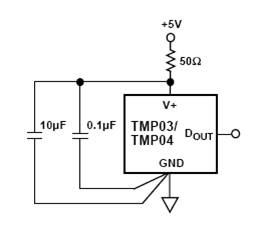 TMP04 generates a modulated serial digital output that varies in direct proportion to the temperature of the device. It has an overall accuracy of ±1.5°C with a sensing temperature range from -25°C to +100°C. The supply bypassing circuit was provided below, following the schematic of the circuit. For noise reduction, a decoupling capacitor of 50Ω is added in. It is powered directly as a single circuit under an operating voltage of +5V. Its temperature feedback signal would be directly connected to the microcontroller. For the temperature sensor circuit, a stable +5V input power is required for the operation. A voltage regulator LM7805 was used to provide a regular 5V output. Decoupling capacitors are added in to reduce noise and also enable it to bypass from the rest of the circuit. Before putting TMP04 into the circuit, its accuracy was tested in the Power Electronics Lab. The sensor left in the oven with a supply voltage of +5V, and its output Dout was connected directly to an oscilloscope outside the oven for the sensor’s high period T1 and low period T2 readings for the temperature range of 25°C to 50°C. In order to normalize the errors, each time the reading was taken twice. An average value was chosen for the calculation of measured temperature. The results for the testing are tabulated below. The result has shown that the readings for T1 are stable at around 8.00ms to 8.06ms, while for T2 readings, there is a slight increase from 15.3ms to 17.4ms for the temperature range of 25°C to 50°C. This can be seen from the graph of Time versus Oven Temperature below. Also, here is a graph of the measured temperature versus the oven temperature and a graph of the output accuracy versus oven temperature shown below. For the above two graphs, it is seen that the sensor has an temperature variation from -1.0°C to +1.5 °C, which is allowable for the system implementation. Meanwhile, the highest error occurs at 25°C which gives a highest error percentage of 4.76% at this point. Hence, it can be concluded that the sensor is very sensitive and accurate for the system. 1. Fine-tune the temperature controller circuit which was developed by the previous FYP student and make it closer to the room temperature and body temperature. 2. Integrate the circuit with the Matrix System. 3. Develop new method for the big system.